When the ICC introduced the Umpire Decision Review System (UDRS) in 2009, their intention was to eliminate the clearly incorrect umpiring decisions or “howlers” as they are commonly referred to. Despite their best laid plans, teams are increasingly using the UDRS in fifty-fifty situations resulting in a much larger reliance on technology in marginal decisions. It seems that the most significant impact of the UDRS has been on LBW decisions. Spectators, commentators and even players often describe the system as confusing and overcomplicated. This post explains the ICC rules and provides guidance as to how the rules are interpreted in reviewing LBW decisions made by on-field umpires. The ICC Rules allow players to request a review of any decision by an on-field umpire regarding a potential dismissal within 15 seconds of the decision being made. The third umpire is then required to review footage and other available information to provide the on-field umpire with any “points of fact” relevant to the decision. The third umpire must answer any questions posed by the on-field umpire with a “high degree of confidence”. The Rules outline what a “high degree of confidence” means in relation to LBW decisions and the third umpire will be required to follow a series of steps which are listed below. Step 1 – The third umpire must first check if the delivery is fair. If the bowler has overstepped or the ball is above waist height then the third umpire need not progress any further with the review. They must inform the on-field umpire and a no-ball will be signalled. Step 2 – The second step is to review both the slow motion replay and “Hot Spot” technology to determine if the ball hit the bat before the pad. If it is determined with a high degree of confidence that the ball hit the bat prior to impacting the pad, then the third umpire will inform the on-field umpire and the batsmen will be not-out (unless the ball is subsequently caught before hitting the ground). Step 3 – The third umpire must then determine if the ball pitched outside the line of leg stump. The rules state that in determining where the ball pitched “the evidence provided by technology should be regarded as definitive”. Hawk-Eye technology is usually used to determine where the ball pitched. The rules state that “if at least 50% of the ball lands outside the line of leg stump, then no LBW decision is possible”. In the diagram on the left, the left-most stump has been assigned the leg stump. A green line is drawn down the pitch in line with the outer boundary of the leg stump. The area to the left of the line, highlighted in orange, is outside the line of leg stump. The diagram also shows four deliveries with a line drawn down the centre of the ball (‘centre line’). Delivery A is clearly inside the line of leg stump while delivery D is clearly outside the line. Deliveries B and C both have some part of the ball outside the line of leg stump. However, the centre line of delivery B is within the line of leg stump as opposed to delivery C where the centre line is outside the line of leg stump. This means that for delivery B less than 50% of the ball is outside the line of leg stump while for delivery C more than 50% of the ball is outside the line of leg stump. No LBW decision is possible foe deliveries C and D.
Step 4 – The next step is for the third umpire to determine if the ball impacted with the pads “between wicket and wicket”. Whether the ball impacted “between wicket an wicket” varies depending on the on-field umpire’s original decision. The reason for the different definitions and the reliance on the original decision is due to the fact that Hawk-Eye predictions have some level of uncertainty and the umpire’s original decision should only be overturned where there is significant evidence that the original decision is incorrect. There must be a “high degree of confidence” that a decision is incorrect before it is overturned and so the ICC Rules impose higher thresholds depending on the original decision. If the original decision is not out then the Rules require that “the evidence provided by technology should show that the centre of the ball at the moment of interception is in line within an area demarcated by a line drawn down the middle of the outer stumps.” The relevant lines are shown in green on the diagram on the left. Note that it is not the outside boundary of each of the outer stumps as in the previous step. The centre line of delivery A is outside the left green line and so the ball has not impacted with the pads between wicket and wicket and no LBW decision is possible. 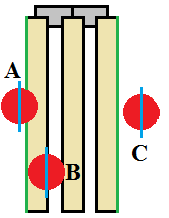 On the other hand, the centre line of delivery B has impacted with pads between the left and right green lines and has therefore impacted between wicket and wicket. If the original decision is out, then the Rules require that the “evidence provided by technology should show that no part of the ball at the moment of interception is between wicket and wicket“. In order for the decision to be overturned, no part of the ball must have impacted between wicket and wicket. Here the relevant boundary lines are the outside lines of the outer stumps as shown by the green lines in the diagram on the left. Both deliveries A and B have some part of the ball between both wickets while delivery C has no part between wicket and wicket and no LBW decision is possible. Step 5 – Provided the ball pitched inside the line of leg stump and impacted the batsman’s pads between wicket and wicket, the final step is for the third umpire to determine whether the ball would have gone on to hit the stumps. Again, the on-field umpires original decision affects how the Hawk-Eye simulation is used. If the original decision was not out, then the Rules state that “in order to report that the ball is hitting the stumps, the evidence provided by technology should show that the centre of the ball would have hit the stumps within an area demarcated by a line drawn below the lower edge of the bails and down the middle of the outer stumps“. 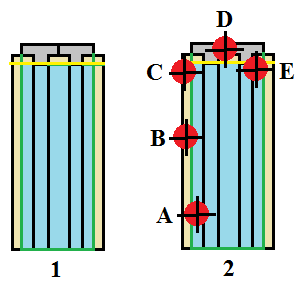 In the first part of the diagram on the left a yellow line has been drawn below the lower edge of the bails and a green line has been drawn down the middle of the outer stumps. The area within these lines is shaded light blue. Hawk-Eye must show that the centre of the ball is predicted to hit within this light blue region. In the second part of the diagram are several possible balls. A vertical and horizontal line is drawn on each ball with the intersection of these lines representing the centre of the ball. The centres of balls A and E are the only ones that fall within the light blue area. The centres of balls B, C and D are outside this region and no LBW decision is possible. The BCCI, the governing body of cricket in India, have expressed reservations about the accuracy of Hawk-Eye. The ICC has acknowledged that Hawk-Eye is not always 100% accurate and there is always an amount of uncertainty.While it has commissioned several independent studies into the technology’s accuracy and have concluded that the technology is accurate enough for the continued use in ICC fixtures, they have conceded that the predictive ability of Hawk-Eye is reduced the further away that the ball pitches and impacts from the stumps. The 3 metre rule addresses this shortfall in Hawk-Eye. Here is where things get slightly complicated. If the point of impact is 300cm or more from the stumps, the original not out decision will stand. If the impact is between 250cm and 300cm from the stumps AND the distance between the point of pitching and of impact is less than 40cm, then the original not out decision will stand. If the impact has occurred between 250cm and 300cm from the stumps AND the distance between the point of pitching and of impact is greater than 40cm, then the not out decision will only be overturned if some part of the ball is hitting middle stump and no part of the ball is above the line of the lower edge of the bail. If the original decision was out, then the Rules state that “in order to report that the ball is missing the stumps, the evidence of the technology should show that no part of the ball would have made contact with any part of the stumps or bails“. This is fairly self explanatory. Did the ball hit the pads first? Did the delivery pitch inside the line of leg stump? Did the ball impact with the batsman’s pads between wicket and wicket? Would the ball have gone on to hit the stumps? The answer to each of these questions must be affirmative with high degree of confidence. In order to answer questions 4 and 5 with a high degree of confidence and taking into account the uncertainty of Hawk-Eye, the evidence required to overturn a decision varies depending on the original decision.